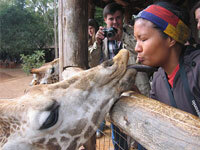 Go to Giraffe Centre to see and feed the famous Rothschild giraffe. 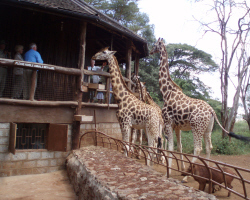 Giraffe Centre is situated about 15 kilometres far from Nairobi and not easy to reach there unless you take a taxi. The Giraffe Center is a non-profit organization founded by Betty and Jock Leslie-Melville in 1979. Situated in Langata, just 20 km outside Nairobi City Center, the Center is dedicated to educating the Kenyan youth in conservation of the environment and the preservation of endangered wildlife and their habitats. The Center is home to endangered Rothschild giraffes, only found in the semi-arid regions of Africa where trees and bushes are plentiful. They live to be about thirty years old and their main enemy is man, who kills them for their meat and hide. Their main defense is their keen eyesight, running speed (up to 35 mph) and their powerful kicks. The conservation of the Rothschild became necessary following the destruction of their natural habitat in Western Kenya and their slaughter in Uganda during Gen. Iddi Amin's era. There are over 500 Rothschild giraffes in Kenya today including seven at the Center. Their conservation is a success story in Kenya and the world. The Giraffe center also home to the leopard, tortoise and boasts over a hundred acres of undeveloped and undisturbed indigenous forest, the remnant of the natural forest that once surrounded Nairobi.The forest is an extension of the type occurring in the adjacent Nairobi National Park and the Langata Ololua forests, which have identical tree species. The forest also has an impressive variety of bird species, which can be viewed throughout the year. 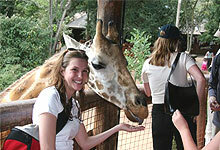 The giraffe center is a wonderful and refreshing experience to enjoy as an excursion while in Nairobi. The tour gives a completely up close and personal interaction where guests have the opportunity to view giraffes as well as feed them. Personal interaction where guests have the opportunity to view giraffes as well as feed them.kiss them,touch them- just a great feeling. Airport transfer from Nairobi Jomo Kenyatta International airport or Wilson airport to Giraffe Centre or trasfer from Giraffe Centre to Nairobi Jomo Kenyatta International airport or Wilson airport.